For actual islands that are part of this peninsula, see List of coastal islands of the Californias. Map of California, circa 1650; restored. The compass rose in the center of the map marks the approximate location of the modern US-Mexico border, south of San Diego. The Island of California refers to a long-held Spanish misconception, dating from the 16th century, that the Baja California Peninsula was not part of mainland North America but rather a large island (spelled on early maps as Cali Fornia) separated from the continent by a strait now known as the Gulf of California. One of the most famous cartographic errors in history, it was propagated on many maps during the 17th and 18th centuries, despite contradictory evidence from various explorers. The legend was initially infused with the idea that California was a terrestrial paradise, like the Garden of Eden or Atlantis. It is probable that this description prompted early explorers to misidentify the Baja California Peninsula as the island in these legends. In 1533, Fortún Ximénez, a mutineer on an exploring expedition sent by Hernán Cortés, discovered the southern portion of Baja California, around present-day La Paz. He was killed by natives but his men returned to New Spain and gave report of their find. In 1535, Cortés arrived in the bay there and named the area Santa Cruz; he attempted to start a colony but abandoned his efforts after several years due to logistical problems. 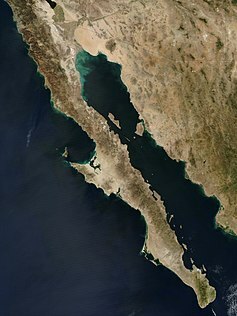 Cortés' limited information on southern Baja California apparently led to the naming of the region after the legendary California and to an initial but short-lived assumption that it was a large island. In 1539, Cortés sent the navigator Francisco de Ulloa northward along the Gulf and Pacific coasts of Baja California. Ulloa reached the mouth of the Colorado River at the head of the Gulf, which seemed to prove that the region was a peninsula rather than an island. An expedition under Hernando de Alarcón ascended the lower Colorado River and confirmed Ulloa's finding. Maps published subsequently in Europe during the 16th century, including those by Gerardus Mercator and Abraham Ortelius, correctly showed Baja California as a peninsula. Despite this evidence, however, the depiction of California as an island revived in the early 17th century. One contributing factor may have been the second voyage of Juan de Fuca in 1592. De Fuca claimed to have explored the western coast of North America and to have found a large opening that possibly connected to the Atlantic Ocean — the legendary Northwest Passage. De Fuca's claim remains controversial because there is only one surviving written account of it found, his account as related to an Englishman, Michael Locke. Nonetheless, this account claims de Fuca found a large strait, with a large island at its mouth, at around 47° north latitude. The Strait of Juan de Fuca is in fact at around 48° N, as is the southern tip of the large island now called Vancouver Island, while the northern reach of the Gulf of California terminates much farther south, at about 31° N. It is possible that explorers and mapmakers in the 17th century could have confused the two (if in fact, they were aware of de Fuca's voyage), and in any case further exploration was inevitable. Indeed, the famed British explorer James Cook narrowly missed the Strait of Juan de Fuca in March 1778, almost 200 years later. Cook even named Cape Flattery (at the northwest tip of modern Washington state) which is at the mouth of the strait, and instead stopped in Nootka Sound just off the west coast of Vancouver Island at about 49° N. His account states "we saw nothing like [the Strait of Juan de Fuca]; nor is there the least probability that ever any such thing existed." However, Cook describes some bad weather in his account around this time, and did continue on to map most of the outer Pacific coastline of North America from modern-day northern California to the Bering Strait in Alaska on the same voyage. A key role in changing ideas about California seems to have been played by an overland expedition led by the founding governor of Santa Fe de Nuevo México, Juan de Oñate. The expedition descended the Colorado River in 1604 and 1605, and its participants believed that they saw the Gulf of California continuing off to the northwest (presumably behind in the Sierra Cucapá into the Laguna Macuata Basin). Reports from Oñate's expedition reached Antonio de la Ascención, a Carmelite friar who had participated in Sebastián Vizcaíno's explorations of the west coast of California in 1602 and 1603. Ascención was a tireless propagandist in favor of Spanish settlement in California, and his later writings referred to the region as an island. As older maps confirm, Spanish authorities and local residents were well aware where the actual northern terminus of the Gulf of California lay, but by extending the coastline north past Cape Mendocino and eventually even into Puget Sound, Sir Francis Drake's claim of Nova Albion for England (1579) could be invalidated by the priority of Cortes' claim (1533). 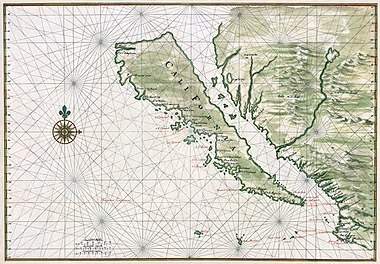 The first known reappearance of the Island of California on a map dates to 1622 in a map by Michiel Colijn of Amsterdam. The image became the standard for many later maps throughout the 17th century and intermittently into the 18th century. Previous maps show the Gulf terminating in its correct location. On the stretch of the Gulf between its actual terminus and Juan de Fuca's strait was written Mare Vermexo ("Red Sea") on later maps drawn from Spanish sources. The Jesuit missionary and cartographer Eusebio Francisco Kino revived the fact that Baja California was a peninsula. While studying in Europe, Kino had accepted the insularity of California, but when he reached Mexico he began to have doubts. He made a series of overland expeditions from northern Sonora to areas within or near the Colorado River's delta in 1698–1706, in part to provide a practical route between the Jesuits' missions in Sonoran and Baja California but also to resolve the geographical question. Kino satisfied himself that a land connection must exist, and the 18th century Jesuits generally followed his example. The first report of Kino's discovery and his map from 1701 showing California as a peninsula were sent to Europe by Marcus Antonius Kappus, a Jesuit missionary from Kamna Gorica (Duchy of Carniola, now Slovenia). In a June 1701 letter, he wrote about that to his friend Philippus Alberth in Vienna and thus acted as an important intermediary in the dissemination of this knowledge. However, Juan Mateo Manje, a military companion on several of Kino's treks, expressed scepticism; European cartographers remained divided on the question. Jesuit missionary-explorers in Baja California who attempted to lay the issue finally to rest included Juan de Ugarte (1721), Ferdinand Konščak (1746), and Wenceslaus Linck (1766). The matter was settled beyond all dispute when the expeditions of Juan Bautista de Anza traveled between Sonora and the west coast of California in the period of 1774–1776. ^ Wood, Mark (2014-03-11). "The Island of California". Pomona College Magazine. Pomona College. Retrieved 2014-07-10. ^ Cook, James (1784). A Voyage to the Pacific Ocean: Undertaken by the Command of His Majesty, for Making Discoveries in the Northern Hemisphere, to Determine the Position and Extent of the West Side of North America, its Distance from Asia, and the Practicability of a Northern Passage to Europe, ... 2. London: W. and A. Strahan. p. 263. Retrieved 2018-05-31.